Here at ESRU we've been enjoying some unseasonably warm weather, even hitting the 80's last week. Although the cold nights have returned, this amuse-bouche of spring has sent my brain into desert field trip mode. As a undergraduate, my first extended field trip was to the Colorado Plateau. The trip was at the end of my freshman year, we left TMLAC in early May, and spent the next two weeks all over the Plateau. As you might imagine this was a watershed moment in my professional life, although my geoscience experience at the time was limited to one introductory course, but by halfway through the trip (camping in the snow on the north rim of the Grand Canyon), I knew I was going to be a geologist. I've returned to the Colorado Plateau a few more times, including a family trip (my graduate present from my parents), and my honeymoon (belated, but incredible). 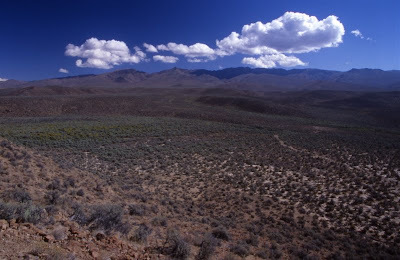 In graduate school I either TA'd or hung out on a Death Valley/Owens Valley/White Mountains spring field trip many times. Depending on the course and professor this trip would change specifics, but at its base always involved a week in the desert. The timing of this trip is really perfect. It was usually smack dab between two academic quarters, a time when you were definitely ready for a break. More importantly, the weather this time of year is amazing. 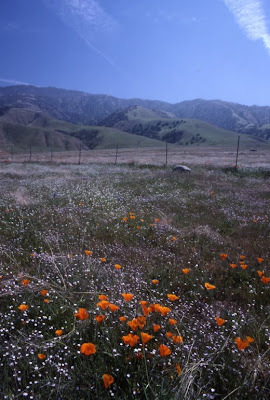 If you are lucky, your trip will coincide with the brief but colorful bursts of wildflowers. The high elevations are still cool (cold even, you can find snow fields once you get over a few thousand feet), and the low elevations are not yet absurdly hot. Most of the campsites cool off enough at night to allow for comfortable sleeping, but once the sun rises you can get away with shorts and Tevas. Plus, you beat most of the crowds. Win-win-win. 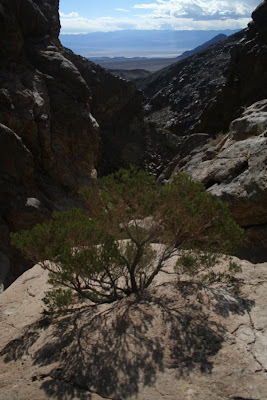 The desert is one of the things I've missed most since moving out here. In truth the region around ESRU is beautiful and scenic, especially this time of year, don't get me wrong. But it is not the same. 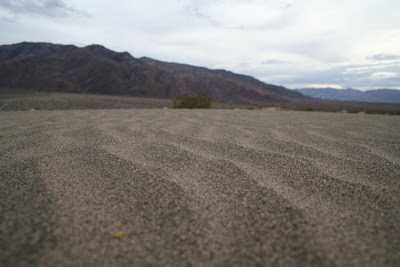 Thoughts of these trips have inspired me to post some of my random pictures from the deserts, a sort of virtual field trip. 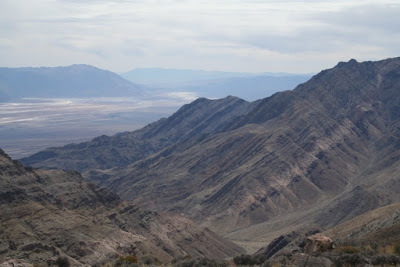 The end of Monarch Canyon in the Funeral Mountains, looking west into Death Valley. 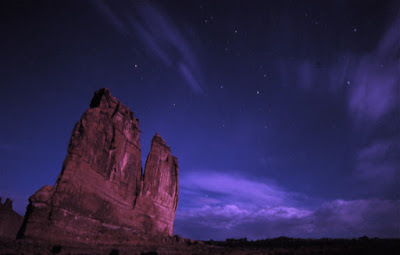 Picture taken by moonlight (long exposure) in Arches National Park. Thanks to my brother for suggesting the technique. 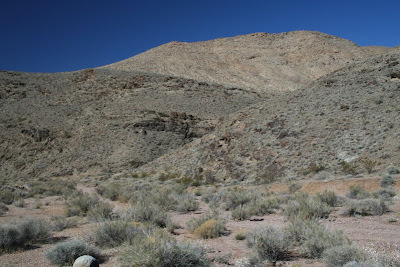 The Boundary Canyon Detachment Fault, Funeral Mountains, Death Valley National Park. View is looking north, fault is at a low angle (it has actually been overturned) right at the break in color. Now I've got spring fever all over again, and I've been on three field trips already. 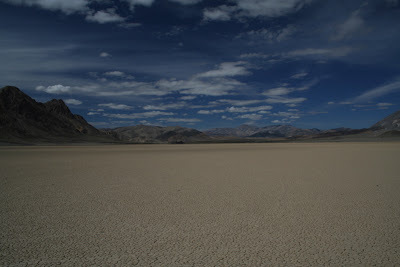 there is something special about the desert that is hard to explain ... I haven't read Desert Solitaire in a while, I remember that did a great job of communicating that. Desert Solitaire! I was actually lent a copy on my very first trip to the southwest. 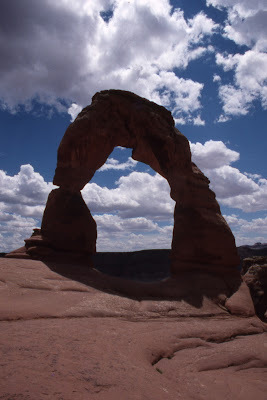 Ed Abbey had flaws, but describing landscapes was not one of them. Incidentally, the spot where Abbey had his trailer in Arches is now a pit toilet, one of the rangers once called it "The Ed Abbey Memorial Pit Toilet", I have a picture I'll have to scan! Andrew - I am jealous of the trips! No spring trips for me this year, maybe next!